I'm a bit of a perfectionist always striving to improve something especially my health. As a perfectionist I do tend to plan ahead, at times a little bit too far ahead and hubster always says 'what you getting that for...' that is until an occasion comes when something's needed and I miraculously turn up with it. So planning only a few weeks ahead this time let's talk about New Year and taking care of you! New Year's a fresh start, time to wipe the last years slate clean, time to find new passions in life, achieve new goals, create new skills and do anything you dream off. Let's all make a promise to each other to aim for something and do it. But, to have a great year I seriously recommend getting your health and body in order first off. Ease Your Tummy - Aloe Vera Juice has so many health benefits I would have to cover it as a single blog post, but I won't just now. This actually tastes OK, the benefits of drinking this far outweigh the fact it doesn't taste like no Cosmopolitan or Red Wine but if you've overdone the alcohol and rich foods, if you have IBS, Heartburn or just seem to get run-down a lot I fully recommend giving this a try for a week or so just so you can see and feel the benefits. A large bottle costs £6.69 and this will last a long time so it's an investment that won't leave you broke. Rundown /Colds & Flu - Reach for the Vitamin C, everyone knows that don't they? Effervescent Vitamin C is a fantastic option for boosting your immune system and lessening symptoms of colds or flu. If you're simply popped and fatigued then this will help pep up your flagging immune system to full health. These are also an affordable option at only £2.75 for 20 tablets, being effervescent they reach your blood stream quicker than non-solubles and taste nice too. Hangover Helper - Been there, done that and got the t-shirt. Hangovers when you get older are no joke. Milk Thistle helps to detoxify and strengthen a liver that's been working over time. Each alcoholic drink you've taken in over the festive season will definitely impact on your liver, if it doesn't work to it's optimum you'll get ill, your skin and hair will suffer and yup your future hangovers won't be no rainbows and unicorns. 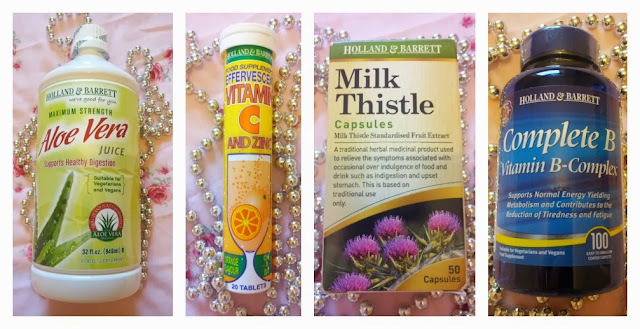 Milk Thistle costs £7.99 for a month's supply. Tiredness / Fibromyalgia or M.E - My favourite supplement of all is Complete B Vitamins. As someone who suffers from severe fatigue (so much so I feel like I'm floating and getting down stairs is hard) I fully recommend B Vitamins as a way to regain some energy and normality. The festive season is tough on most people but for those with a fatigue issue these could be the difference between missing the festive cheer and being apart of the festive cheer. They work by enhancing the effectiveness of the white blood cells which help to fight bacteria and viruses while also ensuring oxygen is getting around your body (if it's not you're going to feel tired). Complete Vitamin B Complex costs £7.99 for 100 caplets. White Teeth - Chances are you've been indulging in some festive treats, I know I have and as much as they're super tasty they definitely play havoc with out weight and our teeth. Coffee, sugary treats and wine and alcohol all dye our teeth. While I'd normally go out and buy a toothbrush I am completely in love with the Slim Sonic toothbrush. I've admitted on here before that when it comes to germs I am OCD, it's my flaw and I'm definitely trying to deal with it. The thing is when you're OCD about germs you can imagine every possibility that they could cause you and your family issues. One major issue is toothbrushes. Did you know that the health department recommend you put the toilet lid down before flushing? It's because the germ filled water (that's being nice) can actually travel far enough so that toilet bacterial (being nice once again here) can travel far enough to reach the other side of your bathroom. That includes especially toothbrushes as the sink is normally beside your toilet - nope moving your brushes to the other side of the basin won't work. So you can see why this is genius right? 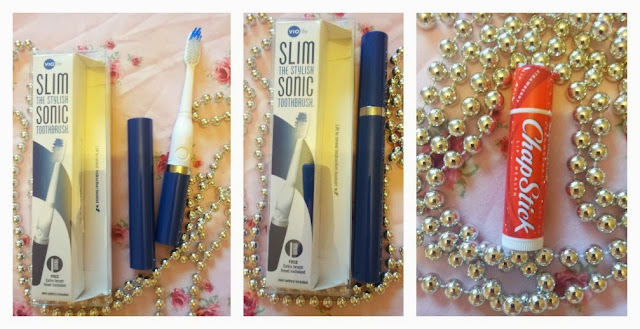 not only does it look chic, it's super sonic which means your teeth get a fantastic clean and it has a top that you pop back on after brushing to protect your bristles from said bacteria. This design is plain but you can get lots of fun styles.